This wasn't a commission, but I really love this painting, and think it's a great example of the sort of painting you could have. 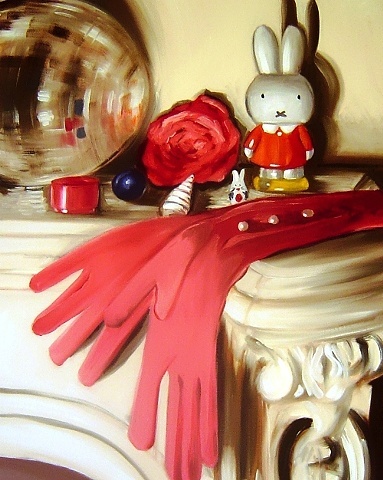 The objects in this painting, long evening gloves, a rose corsage, a glitter ball and Miffy, tell a story about their owner (they're mine, so I'll leave it to you to analyse the meaning!). Take a look around your home, and find your most cherished or sentimental objects... it could be a perfume bottle, an ornament on your mantelpiece, a cinema ticket and a baby bootie... a teddy bear, a bottle of vintage wine, a cricket ball and a bar of your favourite chocolate. Anything you love, and think would look great on a picture on your wall! If you bring me your treasured possessions, I promise to take care of them- or, alternatively get in touch, and we can talk about my working from your photographs.